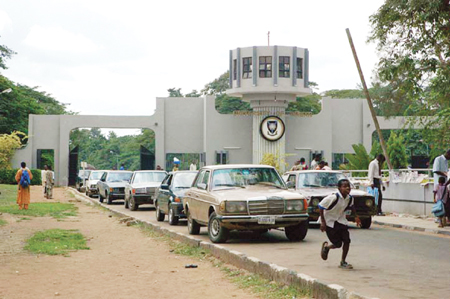 The University of Ibadan (UI) has tightened security following a threat by a terrorist group to bomb the institution before the nation’s 56th Independence anniversary. Some students share their thoughts on the matter with MERCY ADEDIGBA (100-Level Communication and Language Arts Education). At a time when the University of Ibadan (UI) is basking in the euphoria of its new feat of ranking 601 among top 1,000 universities globally, and the only Nigerian university on the list, a message from a terrorist group, Al-wilayat al-Islamiyya Gharb Afriqiyya, threatening to bomb the university before October 1, is not creating panic on campus. But news of the latest ranking published by Times Higher Education (THE) on its website made the university community ecstatic. The message from the terrorist group was mailed to some members of staff. Part of it reads: “Most of you are going to die before Independence Day. You will not spend the Independence Day in peace, you and your students. “Even your little searches at the gate won’t do anything. By the time we are through with you, your government will be sorry. Reacting to the message, the Director of Public Communication, Mr Olatunji Oladejo, urged members of the community not to panic, describing it as a mere rumour. In a statement signed by Oladosu Olaleye Lystra of the Public Relations unit, the university said it had made efforts to secure the campus. However, there has been mixed reaction to the threat. Some students said they were not aware of the threat. Olukotun Tosin, a 300-Level student of Agronomy, believes the university is not doing enough to avert a bomb threat. “Whatever would be would be. If the institution would be bombed it cannot be prevented. Despite the threat, the institution did not bring any of the armed forces to help; just the institution’s security has been searching vehicles and people at the gate. Even Muslim women were searched. Let’s just hope it is not true,” he said. Many of those aware have however called the group’s bluff, describing the message as a rumour. Dike Glory, a 300-Level student of Agronomy, thinks it is a bluff. “It is impossible. How can they bomb UI? It cannot happen. Never!” she said vehemently. Adeniran Kehinde , a 200-Level student of Biochemistry, said: “Let me tell you, whether I go home or I stay in school, if it is my time to die, I would die. The bomb could detonate at the gate. But I heard it is a rumour”. Ajewole Olajumoke, a 200-Level student of Educational Management, said: “It is a lie joo; nothing can happen to me even if the whole of UI is bombed, I am safe”. Wisdom Ighodalo , a 100-Level student of English, said it wasn’t the first time the rumour would surface. “The Lord is my shepherd; nothing can happen to me. But I don’t think it is true. The same thing happened about three years ago,” he said. Omole Brandie, a 400-Level student of Sociology, said students might be behind the threat. “I don’t think it is true . It might be a prank played by a student,” he said. The leadership of the Students’ Union of the institution also urged students not to panic, describing the message as a prank.